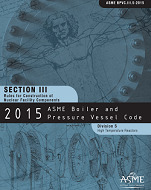 BPVC-III-5-2015, Division 5 of Section III of the ASME Boiler and Pressure Vessel Code (BPVC) provides construction rules for high-temperature reactors, including both high-temperature, gas-cooled reactors (HTGRs) and liquid-metal reactors (LMRs). These rules are for components exceeding the temperature in Division 1 and are meant for components experiencing temperatures that are equal, to or higher than, 700°F (370°C) for ferritic materials or 800°F (425°C) for austenitic stainless steels or high nickel alloys. Importantly, Division 5 also contains the new rules pertaining to graphite core components. These new rules include general requirements, plus design and construction rules, for graphite. Irradiation effects on graphite are addressed, as are the features of probabilistic design reflected in the determination of graphite material strength properties. This first edition reflects new, safety-criteria approaches for nuclear power plants-accumulating rules conveniently into one, single book format. These rules have been updated and improved over those still in Code Case format. Various industries are beginning to appreciate the unique advantages that exist with nuclear power plants that operate at elevated temperatures. For example, HTGRs can yield higher operating efficiencies, provide not only electrical power but also process heat for other industries, and can be designed to be passively-safe. Intended for those nuclear facilities and power plants that experience operating temperatures that exceed the limits established in Section III, Division 1. At this time, both high temperature gas-cooled reactors and liquid metal reactors are identified as being within the scope of these Division 5 rules.